Time for another break in the Paris food posts to write about Peach Ice Cream. One day we came home and discovered our neighbors had left us a bag of juicy peaches. There were a lot of them, so SP suggested a peach ice cream. I said OK.We know we like the egg custard ice creams, so we did some research and ended up making our own recipe. At first, the peach taste seemed too faint, but after a bit in the freezer, it got stronger and tasted more peachy and less vanilla-y. This is a yummy ice cream, one I'd happily make again. 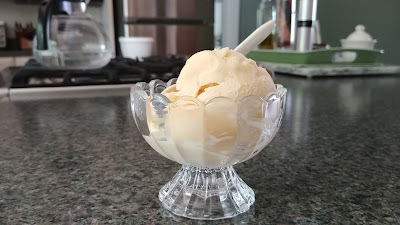 Next time, when we churn the ice cream, we would use peach schnapps instead of vodka. Peel & slice peaches. Mix 1/4 c sugar with peaches. Macerate overnight. In saucepan, heat milk. Stir in 1 c sugar and the salt. Stir until sugar & salt dissolve. Whisk egg yolks in a bowl. Slowly add the hot milk to the yolks, whisking constantly. Return mixture to saucepan. Cook, stirring constantly, until the mixture coats the back of the spoon. Remove from heat. Cool quickly by placing pan in a bowl of ice water. Stir in the heavy cream & vanilla. Cover with plastic wrap, pressing wrap onto surface of custard. Refrigerate custard overnight. The next morning: Place the macerated peaches in a blender and process until pureed. Stir pureed peaches into the custard. Add a tbsp of vodka/schnapps. 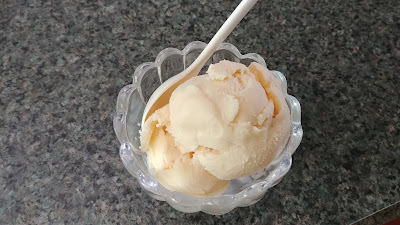 Churn the peach custard mixture in the ice cream maker.